Are you anxiously waiting for the release? Well it is here! Today all the new products we have been showcasing for past three days are now available for purchase at the Taylored Expressions Store. Here is one more card using the new Notable Bloom background stamp set, Herringbone embossing folder and Flowers for a Year stamp set. I have white heat embossed the Notable Bloom background stamp set on watercolor paper which is die cut using the second largest die from Stitched Rectangle Stacklets. I then used distress inks Wilted Violet, Seedless Preserve, Salty Ocean, Mermaid Lagoon, Twisted Citron, Mowed Lawn, Mustard Seed and Fossilized Amber. I started with a white brush and used the lighter shade of distress inks to give a light colourwash, dried the colourwash and then added two layers of the darker shade to give depth and texture. I also sprinkled some clear water which pushes the colour to the nooks and corners of the embossed image. this gives some light areas and some dark areas of colour as well. 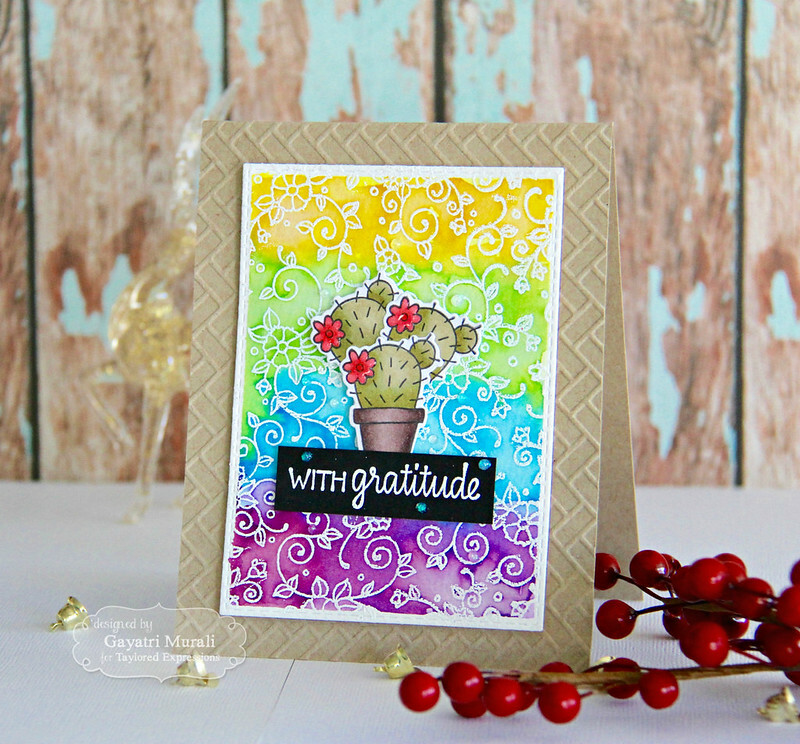 I ran my Toffee card base using the new Herringbone embossing folder to get dry texture on the background. I adhered the watercolour panel on the card front using foam adhesives. 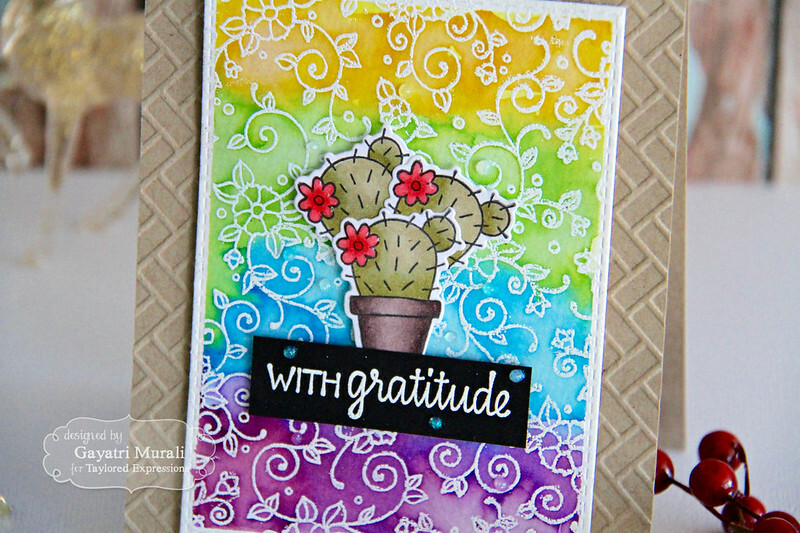 For the focal point, I stamped the cactus image from Flowers for a Year stamp set, three times on sugar Cube cardstock using Oreo Hybrid ink and coloured the images using copic markers. I die cut them using the coordinating die. I trimmed two of the image in half as I did not water the pots. I adhered the two behind the full image to give a cluster of cacti. I adhered that to the centre on the watercolour panel. The sentiment also from the Flowers of a Year stamp set which I white heat embossed on Oreo cardstock strip and adhered. I embellished subtly using Nuvo White Blizzard glitter drops. I added Nuvo clear crystal drops to the flowers on the cacti. Hope you like the card. I have listed all the supplies used to make this card below. Check out Taylored Expressions blog for more designer inspiration and all the new products are now available for purchase at Taylored Expressions Store. What a cute, vibrant card. I love the background. Thanks for the details of how you got this look. Have a wonderful day!